KISSIMMEE, FL--(Marketwired - December 08, 2016) - Today we are excited to announce our HUGE deal with The Gravity Group, an American based company out of Cincinnati, Ohio. As part of the deal The Gravity Group will custom design a new Roller Coaster that will be built for Fun Spot America's Kissimmee,Florida location. 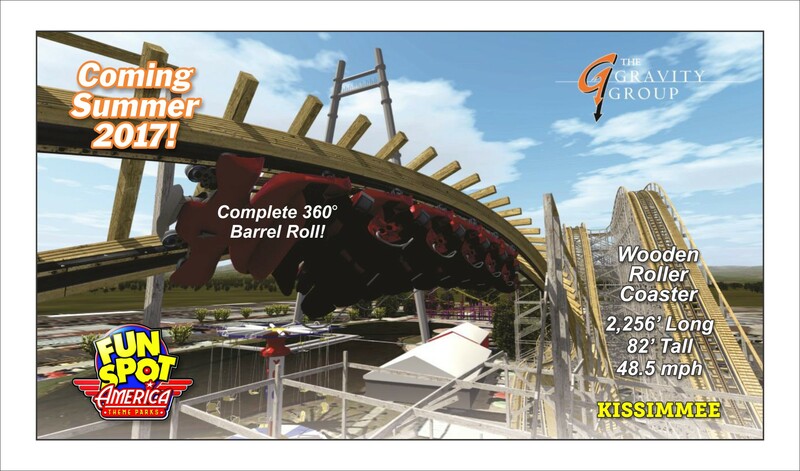 John Arie Jr, Fun Spot America's CEO stated, "This is HUGE news not just for us but the city of Kissimmee as this will be the only wooden roller coaster in the southeast United States that will feature a 360 degree barrel roll . This roller coaster will be completely unique and thrilling, we have worked tirelessly with the Gravity Group to design a ride that will be a must ride coaster for any thrill seeker and coaster enthusiast,definitely bucket list worthy. We are still working through the Theming,naming rights and sponsorship opportunities but with over Two million visitors to our parks each year we do expect to move forward quickly on these opportunities. This is HUGE news for all of us in this community as we all continue to raise the bar and level of expectations when guests visit our city. Let's Make America Fun Again!" Fun Spot America will be making an investment of $6 Million dollars for this new addition. This project will add 50 new jobs to the local economy during construction. Fun Spot America will also add an additional 20 new full time positions once the new Roller Coaster opens in the summer of 2017. Fun Spot America Theme Parks are Central Florida's only family owned theme parks, with two locations Orlando and Kissimmee. John Arie, Sr., owner and founder of the Fun-n-Wheels attraction in 1978 then developed and expanded the property into Fun Spot America Theme Parks. Fun Spot America Theme Parks features unique patented multi-leveled go-kart tracks, Arcades, Roller Coasters, Family, Kiddie, and Thrill Rides. It is home to the largest arch (Orlando - 250 ft.) and tallest (Kissimmee - 300 ft.) SkyCoasters in the world. It has Orlando's only wooden roller coaster (White Lightning). Fun Spot America Theme Parks currently employs approximately 500 employees. 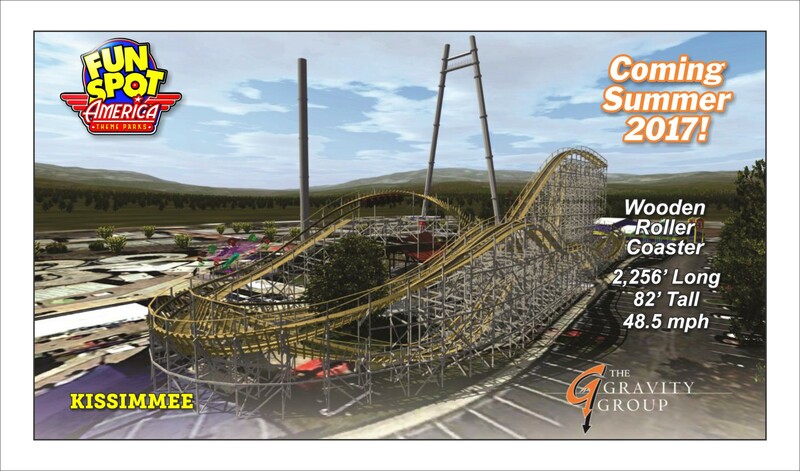 The Gravity Groups video concept of Fun Spot America's new Roller Coaster. The Gravity Groups rendering of Fun Spot America's new Roller Coaster. 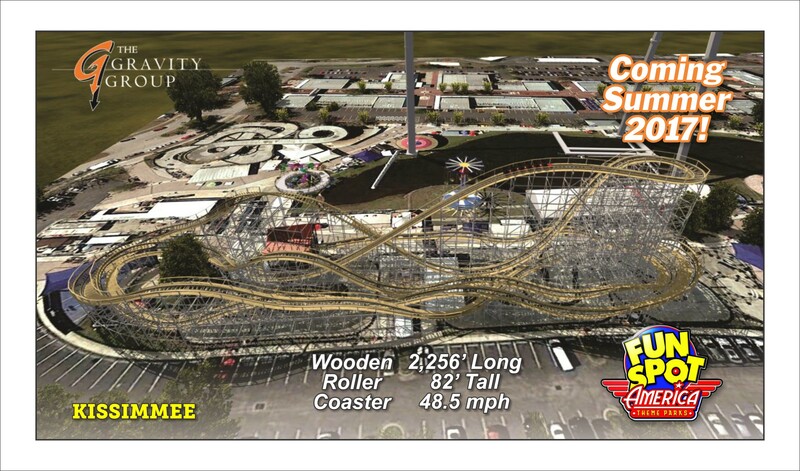 The Gravity Groups rendering of Fun Spot America's new Roller Coaster for it's Kissimmee,Florida location.